Trudi Gunia – Global Citizenship to me means that we must be aware and concerned and act wherever and however possible for the well-being of all people globally. It helps to put oneself in the opposing situation; to empathize. Armella Sonntag – A global citizen believes that everyone is equal, is entitled to a dignified life, and should have the resources to exercise their potential to the service of humanity. We can be global citizens without leaving our borders. Indeed, I think these are some of Canada’s finest global citizens; those who have a clear vision and work tirelessly in their own Canadian community to effect change well beyond our borders. This is very hard work. A global citizen, in communion with others, is constantly learning, educating and acting upon what needs doing in order to build a peaceful and just world. 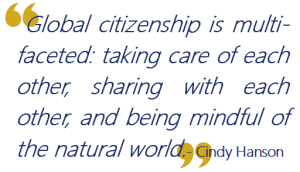 Cindy Hanson – Global citizenship is multi-faceted: taking care of each other, sharing with each other, and being mindful of the natural world. During my younger activist days I learned two phrases from work with Indigenous and Latin American friends: “We are all related”, and “¡El pueblo unido, jamás será vencido!” (the people, united, can never be defeated). Taken broadly these phrases emphasize what global citizenship means to me. It also means that I have a responsibility to others and to the world around me to be the best activist, mother, educator, and friend I can be, in my work for a just, peaceful, and sustainable world. Klaus Gruber – Global citizenship means that all of humanity is one extended family. There have been many artificial divisions that humans have used to organize humanity – tribes, race, religion, geography, borders etc. However, we have much more in common than we have divisions. When we begin to see that once we meet our common needs for belonging, relationship, core needs such as food, shelter and security, we will have a world that has the possibility of harmonious co-existence of all people in the world and with the earth itself. What do you feel are some of the biggest challenges currently facing our global community? What do you identify as possible solutions to these challenges? Klaus – There are many challenges, the greatest of which might be that so many people still consider their self-interest compromised if others’ interests are also elevated. This sense of constant competition means that many of our systems (politics, education, economic, geographic) tend to advance skills to “win” over others rather than advancing everyone. There are no easy solutions to the challenges we face. It involves education, healing, working together to accomplish common goals. Perhaps the most important work is to continue to help develop empathy. The increasing shrinking of the globe and the increasing interaction among people has been both a challenge and a blessing. More people than ever have regular exposure to other cultures, differing world views and people who have had very different life experiences. This has created the opportunity for understanding and more of a sense of connectedness. However, for some, it has also expanded their sense of suspicion and fear. Unfortunately, politicians sometimes help fuel those feelings in order to gain control. All efforts of people coming together to enhance our collective nature and to ensure the common good must be supported and strengthened. Armella – The challenges of humanity are intertwined and inseparable. Desperate poverty, violence and ecological degradation compound upon each other in a negative spiral. I believe that this requires humanity to restructure local and global economies into sustainable economies. I understand ‘sustainability’ to mean ensuring the continual evolution and flourishing of humanity and our planet. Peace will have a chance to emerge when no one suffers the hopelessness of poverty or the possibility of ecological catastrophe. It would mean a leveling-out of the disparities between rich and poor. Transforming our economic structures requires the transformation of our lives; our hearts, minds and spirits which re-awakens appreciation for what the earth and the human heart can offer us (far removed from consumption and exploitation). Through education, lifestyle, advocacy and the engagement of our spiritual lives, change can begin to occur, and of course it is happening all around us in so many ways. Trudi – The biggest challenges facing our global community are violent conflict, now particularly in the Middle East, the environmental problems and what now appears to be the rise of intolerance and hate. One of the solutions I believe is for rich, powerful countries to keep out of sovereign nations – that includes the use and sale of military hardware – and allow nations to find solutions to their own problems. Another solution which could be much more difficult, is to create an awareness of the problems which all humanity faces. There could be any number of solutions but I think it is impossible for one person to say what that is. Global problems are so varied and enormous that they may become too difficult to solve as we find we take three steps forward and two back. Cindy – Three global challenges that stand out for me are growing fundamentalism, militarism and individualism. Fundamentalism (religious and nationalistic) blocks dialogue, creates narrow-mindedness, and increases violations of human rights. Fundamentalism is linked to militarism, which limits opportunities for peace and justifies violence. The emphasis on individualism, often reinforced by capitalism, breaks down our abilities to relate to each other and to the natural world. Together I believe these three challenges increase global inequality in multiple and complex forms. Possible solutions to global challenges can occur when people work together for change (for example, through participatory and direct democracy); change inequitable structures; and engage in activism; and finally, support communities and organizations that are working for change. I personally support InterPares, Oxfam Canada, Canadian Council for Policy Alternatives, Canadian Research Institute for the Advancement of Women (CRIAW), Doctors Without Borders, Rights Action, Amnesty International, Idle No More, and DAWN to name a few. Klaus – I receive constant inspiration from my children and my students, in that they are often far ahead of me and my generation in focusing on the most important values for the future of the earth. Also, when I get frustrated, I try to remember that within a few decades the Berlin wall came down, apartheid ended and the European Union came together. These are all steps in the ongoing development of the global community and seemed impossible only a few decades earlier. Armella – I find inspiration in: people with whom I work in Development and Peace; their energy, intellect, conviction and good humour. People in the global south who live in extreme conditions and transform lives and structures against all odds. My religious beliefs. My family, my children and upbringing. 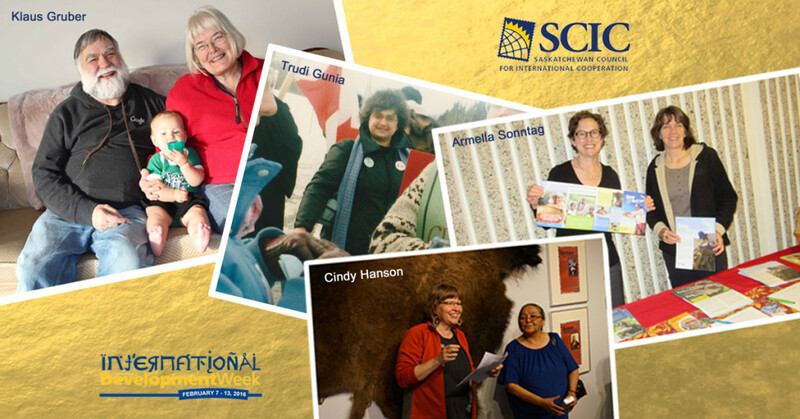 The SCIC network – forming a community of so many, many good people. Trudi – My inspiration comes from my father and from life itself. Cindy – In my early years I was inspired by the Sandinista revolution in Nicaragua and the Co-operative Youth Program in Saskatchewan. They both built my vision of what was possible when people worked together. Grassroots and social movements that have influenced the field of adult education such as labour movements, agrarian movements, and indigenous and feminist movements continue to be sources of inspiration for me. What advice would you give to today’s youth that are considering going into International Development work? Armella – Good will and passion are essential, but not enough. Get a globe and become a news junky; get regular news from various sources. Choose a profession which will enhance sustainability of our earth, helping to propel us forward on this trajectory. Help rejuvenate and strengthen existing organizations; help them evolve. They have decades of experience and wisdom to offer you as a foundation to your work. 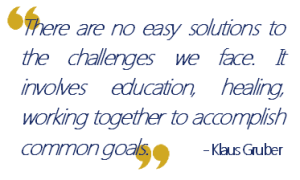 Klaus – International Development work carries with it huge rewards, mostly in the richness of the relations that one develops throughout the world. It is, however, not for the faint of heart. There is a lot of pain and suffering out there and in development work, it must often be faced head-on. It is also critical that we know ourselves and that we surround ourselves with personal supports. Self-care is essential. Trudi – The only advice I could give anyone going into International Development work is to get a good education first and then a deep awareness of the people and environment to which they plan to go. They must be aware of the pitfalls and that change comes very slowly, if at all, and they may not be welcomed, depending on their approach. When Presidents, Prime Ministers, Popes etc. are at a loss as to solving the global misery, it would be a miracle if I could come up with the answer. Cindy – Here are four pieces of advice: watch foreign films; travel with an open mind. Read Eduardo Galeano, Paulo Freire, and authors from the global South. Be mindful; engage in work that is meaningful and leads to social consciousness. Take time to act and reflect – “We make the road by walking” (P. Freire).